On Friday, Rajasthan Royals leg-break spinner Shreyas Gopal registered his best figures against Chennai Super Kings at the at the Maharashtra Cricket Association Stadium in Pune. The leg-spinner was introduced into the attack by Rahane in the 7th over. From removing one danger man to another, Shreyas Gopal then dismissed CSK skipper Mahendra Singh Dhoni, who has been in red-hot for the Chennai side this season. While Raydu was removed by Laughlin, Shane Watson continued his rampage run against Rajasthan Royals. In a match where Australian all-rounder stole all the limelight with his third century in the 11th edition of Indian Premier League on Friday, Rajasthan Royals leg-break spinner Shreyas Gopal registered his best figures against Chennai Super Kings at the at the Maharashtra Cricket Association Stadium in Pune. After winning the toss, Rajasthan Royals’ captain Ajinkiya Rahane opted to field first against MS Dhoni’s men on matchday 17 of the ongoing IPL. The Chennai Super Kings started brightly with Australian batsman Shane Watson, who took the charge for Dhoni’s yellow army against the 2008 champions. 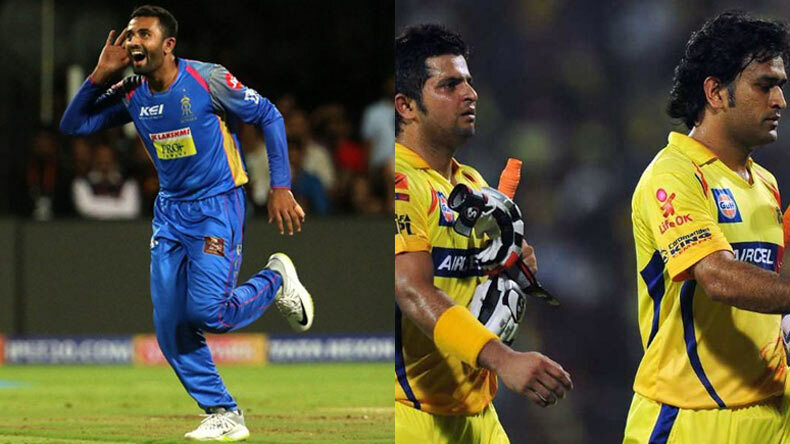 CSK’s opening pair of Watson and Ambati Rayudu crossed the 50-run mark emphatically within the first five overs. While Raydu was removed by Laughlin, Shane Watson continued his rampage run against Rajasthan Royals. As Laughlin drew first blood for the Ajinkya Rahane’s men, spinner Shreyas Gopal then took centre-stage for the Rajasthan Royals and went on to produce his best figures. The leg-spinner was introduced into the attack by Rahane in the 7th over. Gopal, who joined Rajasthan Royals after a shady spell with Mumbai Indians claimed his first victim in the form of set batsman Suresh Raina. From removing one danger man to another, Shreyas Gopal then dismissed CSK skipper Mahendra Singh Dhoni, who has been in red-hot for the Chennai side this season. The 25-year old picked his third when he dismissed Sam Billings who continued his disappointing run for CSK. Although Shane Watson made it big for CSK and slammed the fastest century in this season’ IPL that came in just 51 balls, Shreyas Gopal was the silver lining for Rajasthan Royals as the fruitful leg spinner registered his best figures with 3/20 in four overs.